Several people have asked me recently why I started making art in recent years? It’s a tricky question to answer fully (beyond the obvious “because I wanted to”) so if you are interested in the long answer to that question read on. If you are on my mailing list you will know that I originally trained as an industrial designer, and I worked as a designer for many years. Industrial design was my version of architecture (the common profession in my family). . . I love being an industrial designer. It shapes how I see and think. The opportunity to pursue art coincided with discovering a couple of things online that I found really inspiring - though at the time I had no idea where they would lead me. A giant human and architectural performance realized by NOTsoNOISY Guillaume Reymond and Trivial Mass. The 11 floors tower of the HESAV (Health High School Vaud) has been animated as a rudimentary screen whose pixels are, in fact, all the windows and shutters that students, staff and friends shake for hours. I saved this video because it struck a chord with me - I had no idea that it was the start of something new for me. I kept going back to it, and showing it to my friends, there was something about it that flicked a small switch in my subconscious. It clearly is nothing like the art that I make (I don’t work with video), but it was a catalyst nevertheless. Having said that, it does have a certain visual rhythm and geometry to it. And I like how it plays with the building, using it like a dot matrix display, pretending to be something that it is not (which in a way is a parallel to the way flat things can appear three dimensional - something I like to play around with). Comprised of what at first appear to be three blank white walls, the Hyper-Matrix installation quickly comes to life as thousands of individual cubic units forming a field of pixels begin to move, pulsate, and form dynamic images across the room, creating an infinite number of possibilities in the vertical, 180 degree, landscape. Both videos were from the website designboom.com. I recommend having a poke around the website - it’s a great source of interesting articles about contemporary art, design and architecture, interiors and technology. . . you can waste hours on there! The shadows in the second video really captivated me, and I decided I wanted to make some sort of sculptural work inspired by this moving wall. I started making models, based on this video. I began with balsa wood blocks, then foam card. I just wanted to explore the forms and the shadows that they created, and my plan was to cast them in white plaster - I wanted them to be entirely white, so the shadows alone would describe the forms from a distance. You can read more about how this exploration led to my monochrome shadows series of paintings in a previous blog post. I also explored using colour to delineate height (or depth), but it still didn’t feel right to me. So I just kept iterating, continuing to explore shadows and form, enjoying photographing the models under different lighting conditions. Around this time we took our kids on their first ever trip to France. My husband and I used to live in the UK, and we went to France regularly - it was a favourite place to spend our summers camping, on our way through to Italy. Of all the art museums and galleries that we visited on this recent trip, it was a tiny gallery in Paris that was the final spark for me. 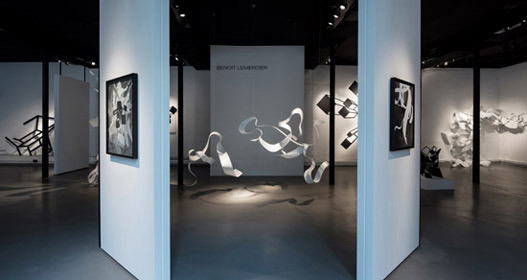 There was an exhibition by a French artist, Benoit Lemercier. 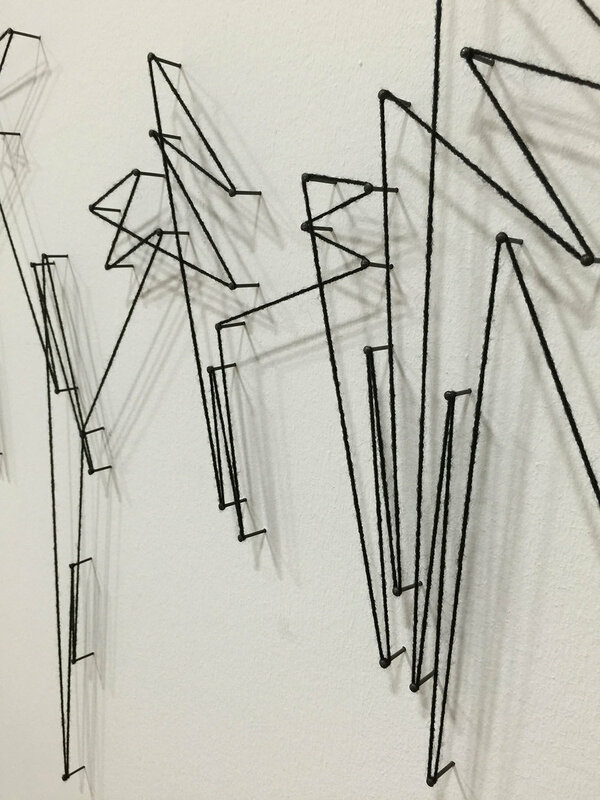 It was a mixture of sculpture, paintings and work that crossed the boundary between the two. His work resonated with the 3-dimensional designer in me. . . . and new ideas started to form. As we travelled I began to see things in a slightly different way, perhaps with more of an artists eye this time, rather than that of a product designer. The light in France is different from the light in New Zealand, and the textures of the buildings are different, the shadows they create are different from those here. Even a small village street was incredibly stimulating in terms of forms and shadows. Amongst many galleries we visited (much to the frustration of our kids!) was the Fondation Vasarely museum near Aix en Provence. 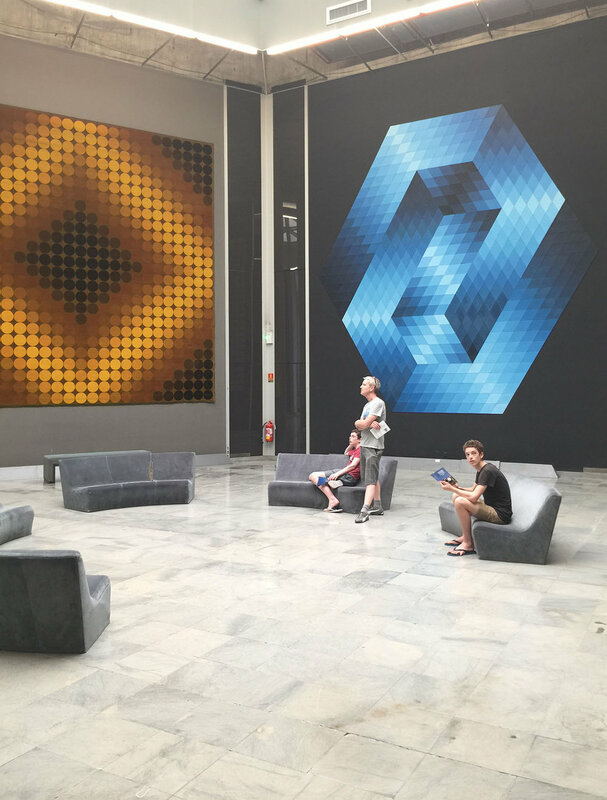 It was 20 years or more since we had last been there, and although a little run down now it is still a captivating place, with enormous artworks that seem to envelop you, within a building that is itself like a Vasarely sculpture. I admire Vasarely’s work, in particular his simple black and white works, and the ones which play with perception of form. I grew up with a little Vasarely print on my bedroom wall. NZ is very isolated geographically, so being able to see so much famous (and lesser known) art first hand again in art museums was very stimulating. There is no substitute for the real thing, despite how much the internet opens up the art world and helps us to feel more in touch with what is out there. On returning to NZ I decided that my way forward was to explore painting the shadows of my little sculptural mockups - you can find out more about this in a previous blog article I wrote here. I fished out my acrylic paints to get started, bought myself a canvas, and began. . . let’s just say that when I look at it now it’s not quite as bad as I thought it was then, but it wasn’t all I wanted it to be! My biggest learning from this was that precision is reallllly hard to achieve, and that if you paint something precise with the wrong colours you’re a bit stuffed!! . . . . Time to study colour mixing, and to plan colours first on the computer! So - I studied colour and technique - a lot - the internet is a good art school once you find the right teachers! 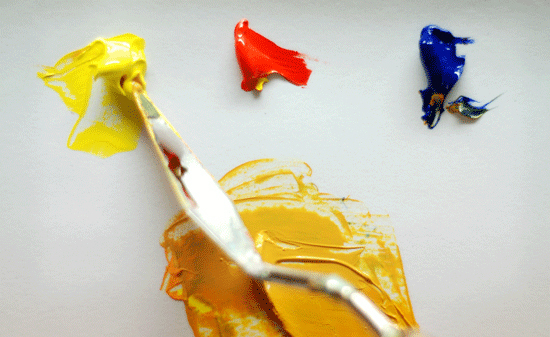 I recommend checking out this website: Will Kemp Art School. It has taught me so much, despite the fact that the type of painting Will Kemp does is nothing like my own painting style - but the information is still highly relevant, with incredibly helpful, easy to understand articles and videos. I can’t recommend it highly enough. I went back to my original Bauhaus-style design education and revised on all my colour theory, I learnt how to mix colours accurately, how to analyze them and tweak them. I now mostly pre-plan my paintings before I start, and then make (mostly) subtle colour tweaks to the painting to get it just right. I find this approach saves me time and more importantly stress and disappointment! Also, working on the computer first leads to some interesting unintended design outcomes - I will write another post about that one day to elaborate on what I mean by that. Some of my most interesting developments have happened by accident on the computer. Around the time that I painted my first canvas I also bought two little books that changed everything for me. 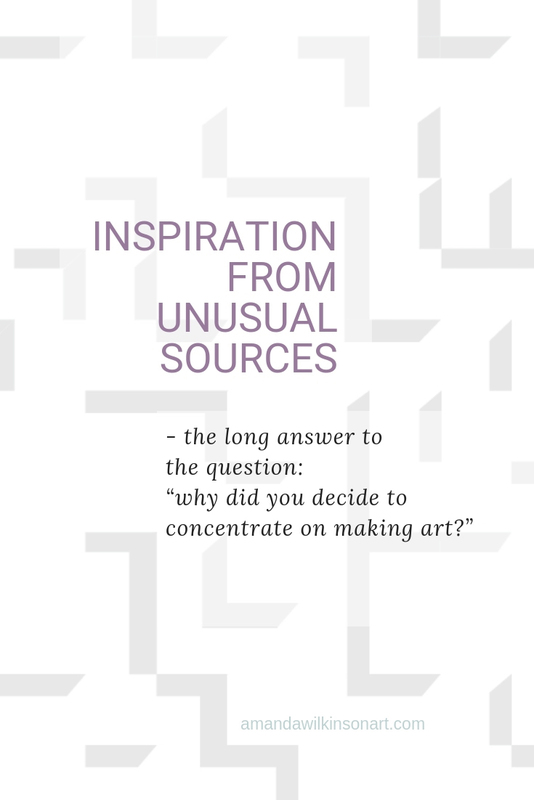 They are both by Austin Kleon - Steal like an Artist, and Share your Work. They are tiny books, with a big bold message, and they changed everything for me. They free up your creativity and take away the fear of trying (and of putting yourself out there!). I will write more about them in a separate post, because I think they are worth summarizing - and I’ve just stumbled on something to put in a blog post that is very relevant to these books! So keep checking back for when I post it, or sign up to my mailing list and I’ll let you know as soon as I add it to my website. Anyway . . . I considered my first painting a flop, but also a huge learning curve - I won’t show it here, I don’t show it to anyone! Reading Austin Kleon’s books taught me not to give up, to just learn from the mistakes and build on what I learnt, and absorb from all those who inspire me - to absorb from many different artists, and combine the influences into something that is ‘me’. And that is what I did . . . and continue to do. By exploring and playing with models and paintings, I found ‘my thing’. I sometimes worry that it seemed a little too easy to find ‘my thing’ - but if I actually analyse it, I think perhaps it was one of those rare cases where ‘being older is better than being younger’! [there don’t seem to be a lot of times when that is the case!] I think that having already had a different career, having been a parent, having travelled a lot, having had time for everything to percolate, it was much easier to have clarity about what my art is, and where it comes from. . . . . It’s funny how those two little videos set me off on a new path! I’d love to know where other people get their inspiration from, especially if it’s not from sources that you’d expect, so if you have any comments or questions I’d love to hear them - good or bad! Feel free to send me an email and start a conversation. If you’d like to read more sign up to my mailing list here and I’ll let you know when I add new articles. My goal is to provide interesting and valuable content without overwhelming your inbox. . . . because I hate spam as much as the next person! I send out emails on a semi-regular basis - when new work is listed, to tell you about what I am working on, about my process and my inspiration, and other things that I really hope you will be interested in. I also send out exclusive offers (only for my email friends) from time to time, so give it a go! You can always change your mind later and unsubscribe at any time.